Click the button below to add the Xendurance Protein 900g - 20g of Protein per serving - Chocolate Whey Isolate Casein to your wish list. XENDURANCE PROTEIN is a proprietary protein sports blend of 18 amino acids containing Whey Protein Isolate, Whey Protein Hydrolysate, Micellar Casein and Calcium Caseinate. This protein blend has been produced with cold process filtration that allows it to be in its most bio-available and digestible form. Maximizing absorption rate and utilization of protein is key to muscle recovery, which puts XENDURANCE PROTEIN in a league of its own. XENDURANCE PROTEIN also contains 1500 mg of lactate, the body's preferred and most efficient fuel source over glycogen. This key muscle fuel helps you lower exercise induced body acid, allowing your body to recover faster. 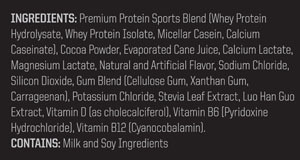 In addition, XENDURANCE PROTEIN contains the US Recommended Daily Value of vitamins B6, B12, D, along with 4255mg of BCAAs and essential electrolytes. XENDURANCE PROTEIN is among the most inclusive recovery products on the market.